Median palatal cyst (MPC) is a rare nonodontogenic fissural cyst. Very few cases of true MPCs have been reported in literature. In the recent years, there is much controversy about midline fissural entities as embryologists and pathologists question epithelial entrapment during embryonic fusion. The WHO in 1992 advocates it to be posterior extension of nasopalatine duct cyst. Hadi et al. in 2001 published an article describing specific criteria for the diagnosis of midpalatal cyst. 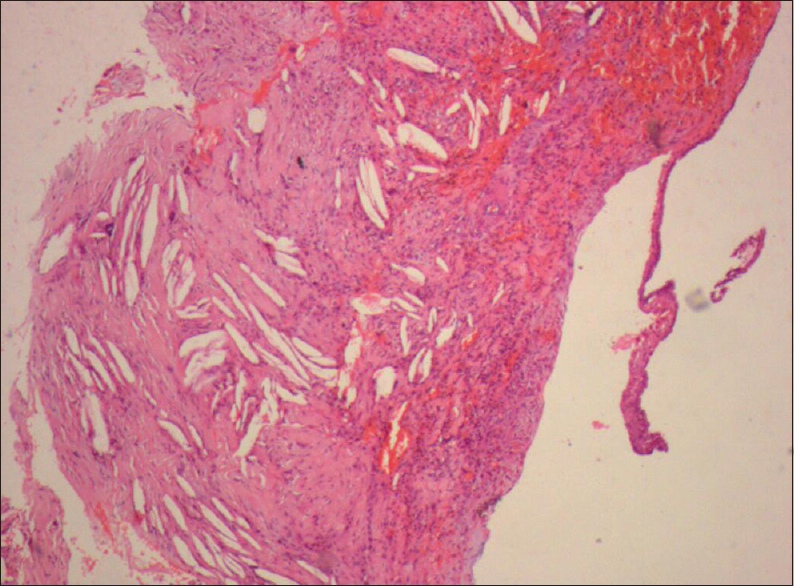 And histologically, it should not have hyaline cartilage, large vascular spaces or salivary glands in the cyst wall. The purpose of this paper is to report a rare case of true MPC satisfying these criteria and discuss the current controversy about these cysts. A 26 year male patient reported to our department complaining of swelling in his palate. He observed the swelling 1 month back and was insidious in onset, which was of the same size since then. No pain or discharge associated with swelling. Medical history was noncontributory, and he is a smoker (8–10 cigarettes/day for 3 years). Oral hygiene was good with no carious tooth. On examination, solitary oval swelling measuring 2 cm × 3 cm was found in midline of palate, 1.5 cm from palatal gingival margin [Figure 1]. Mucosa over the swelling was normal in color and texture, soft and nontender on palpation. 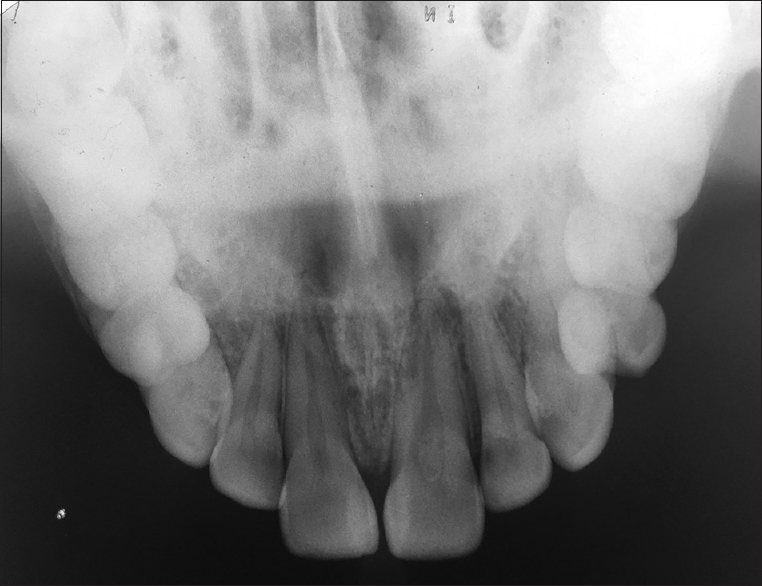 Occlusal radiograph showed symmetrical oval radiolucency in the palate with sclerotic borders [Figure 2]. There was no involvement of nasopalatine duct. Provisional diagnosis of MPC was made. On aspiration, dirty brown fluid obtained and the smear was cellular with muciphages and cyst macrophages on proteinaceous background suggestive of an infected cyst. Enucleation of the cyst was done under local anesthesia. Lesion was approached after raising palatal mucoperiosteal flap, and complete enucleation was done [Figure 3]. There was no recurrence seen after 6 months of follow-up. 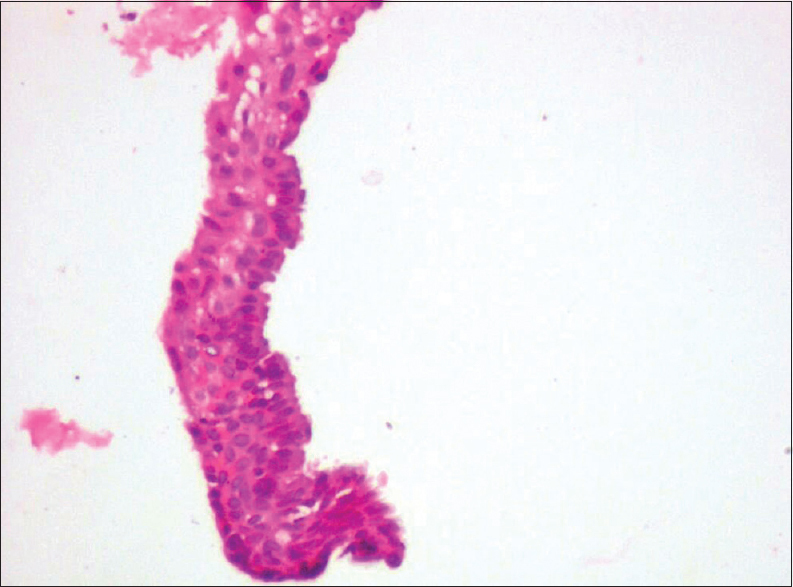 On microscopic examination cyst lined with pseudostratified ciliated columnar epithelium was observed. There were no features of hyaline cartilage, salivary glands or vascular spaces. MPC is a rare nonodontogenic lesion as it represents only 7.14% of all jaw cysts. MPC presents as asymptomatic swelling and has a male predilection. MPC has raised controversy about pathogenesis of such fissural cysts. Clinical presentation of MPC is classically nontender well-demarcated oval swelling in the midline of palate. The cysts which arise in the midline and expand are midpalatal cyst, enlarged nasopalatine duct and nasopalatine duct cyst. Nasopalatine duct cyst is developmental cyst arising from epithelial ruminants of nasopalatine duct. They can be central or unilateral. Radiographically, they appear as heart-shaped radiolucency because the cyst is notched by nasal septum during their development. One of the differential diagnoses should be radicular cyst and hence important to check vitality of teeth and periodontal condition. Donnelly et al. considered this association with vital teeth to be a necessary diagnostic criterion. 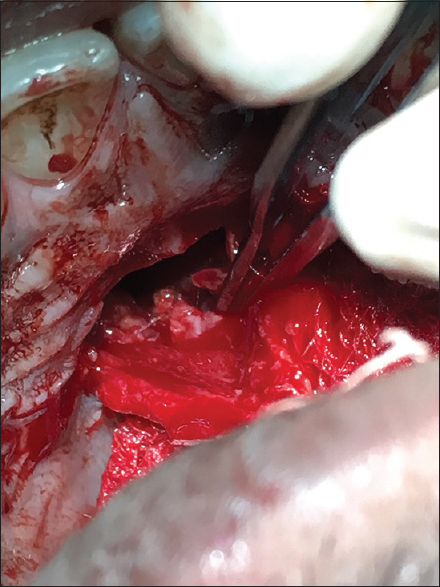 We did not encounter nasopalatine bundle during surgical removal, therefore distinguishing it from nasopalatine duct cyst. No carious tooth or periapical lesions were present and thus odontogenic etiology ruled out. The controversy regarding its existence, originally thought to arise from epithelium entrapped in embryonic lines of fusion of lateral palatal shelves which is questionable. In 1992, the WHO wrote “it is now felt that those (cysts) in the maxilla represent a posterior extension of the nasopalatine duct cyst in the case of a median palatine cyst.” Other theories suggest that these arise from primordial cysts of supernumerary tooth buds or redundant dental lamina. Twenty-two cysts have been reported in the past 40 years and have been greatly reduced, and after 1992, the WHO omitted from the classification. Only three cases have been reported after 1985. Allmendinger et al. recorded computed tomographic features of MPC and clearly demarcating incisive canal and central cyst in hard palate and therefore cannot be call posterior extension of the nasopalatine cyst. Therefore, multidimensional computed tomography can provide more details of the lesion. MPCs are treated by enucleation although there is a case of marsupialization reported in literature. Marsupialization will not allow complete histological evaluation of the cyst, and there may be chances of recurrence. After enucleation of the lesion, complete regeneration of bone will not occur, and the defect is filled by scar tissue and might lead to oronasal communications. Therefore, long-term follow-up is advised. MPCs are rare nonodontogenic cysts and can be diagnosed by clinical criteria, radiological confirmation by computed tomography and histology. This case typically presented clinical, radiographical and histological features of MPC. Bacci C, Valente ML, Quadrio M, Berengo M. Is the median palatine cyst a distinct entity? J Oral Maxillofac Surg 2011;69:1385-9. Rapidis AD, Langdon JD. Median cysts of the jaws – Not a true clinical entity. Int J Oral Surg 1982;11:360-3. Hadi U, Younes A, Ghosseini S, Tawil A. Median palatine cyst: An unusual presentation of a rare entity. Br J Oral Maxillofac Surg 2001;39:278-81. 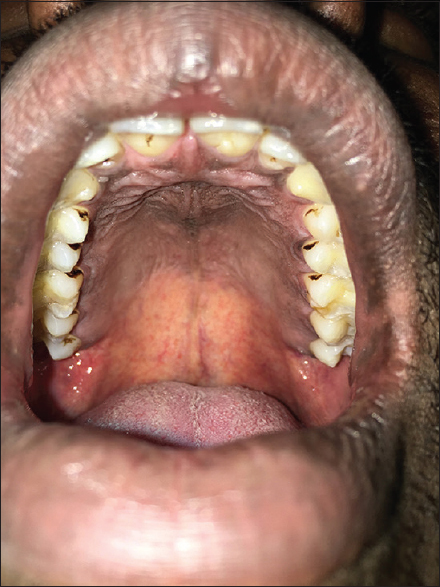 Manzon S, Graffeo M, Philbert R. Median palatal cyst: Case report and review of literature. J Oral Maxillofac Surg 2009;67:926-30. Zachariades N, Papanikolaou S. The median palatal cyst: Does it exist? Report of three cases with Oro-medical implications. J Oral Med 1984;39:173-6. Donnelly JC, Koudelka BM, Hartwell GR. Median palatal cyst. J Endod 1986;12:546-9. Kramer IR, Pindborg JJ, Shear M. Histological typing of odontogenic tumours. WHO International Histological Classification of Tumours. 2nd ed. Verlag Berlin Heidelberg: Springer – Verlag Berlin Heidelberg GmbH; 1992. p. 287. Gingell JC, Levy BA, DePaola LG. Median palatine cyst. J Oral Maxillofac Surg 1985;43:47-51. Allmendinger A, Gabe M, Destian S. Median palatine cyst. J Radiol Case Rep 2009;3:7-10. Rushton MS. A cyst in the median palatine suture. Br Dent J 1930;51:109-10. Killey HC, Kay LW. An analysis of 471 benign cystic lesions of the jaws. Int Surg 1966;46:540-5.